I on Saturday headed to the Farmington, expecting to run into some sad-looking new stockies. You can tell when they’re new: the fins and tails might be beat up from being in tanks and trucks, and scales are usually missing. I also decided to start at a part of the river that has not been stocked yet, an area I call Grand Central Station. It’s that busy there. It’s in the permanent C&R area and is known for big and wily fish with Survivor Strain DNA. I expected to be blanked, which is usually what happens to me there. But, it’s my nemesis, and I wanted to give it a go. So, I left Grand Central, licking my chops and rubbing my hands together. I am grateful for a great day. And, I landed more trout in another stretch. 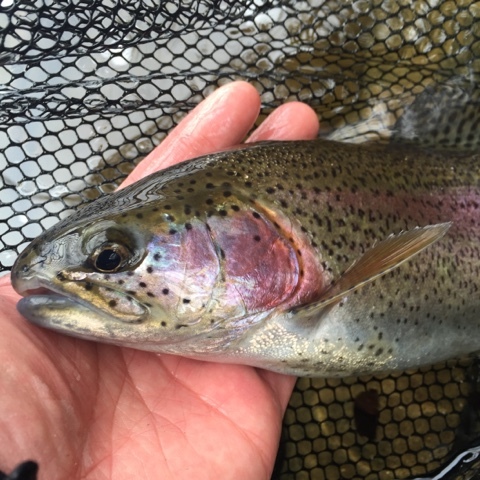 It has taken me many outings to learn just a fraction of this amazing tailwater. You should put the Farmington on your bucket list. My PB trout is from there, a 21″ holdover brown. It’s the fish that keeps me coming back. If you do head over, consider hiring Zach St. Amand as your guide. He lives next to the river and is on the water 200 days a year. I’ll be spending a 1/2 day with him in the spring to explore parts of the river I don’t yet know. He has a great reputation. And, here are some of the fish from yesterday. Edit: all the browns I landed looked pretty pristine. Given the comments below, perhaps, they’re wild? Just curious, what flies were working? I have fished the Greenwoods section several times and really enjoyed it. Did you fish Church pool? The river is pretty dynamic, and so, I follow the advice that UpCountry publishes here. Not going to mention specific spots, though, and hope you understand. That first brown ain't no holdover! That boy has been in the river it's whole life! There are plenty of wild fish in the Farmington, and some a tad larger than 21 inches. Ah! How to tell? Clipped adipose fin? Even a multi-year holdover still has distorted fins and yes some have clipped adipose fins or tags behind their eyes, and that fish has the color and look of a wild one… believe it or not there are almost as many wild fish as stocked fish in the Farmington according to electrofishing done by the DEEP. The wild ones are just harder to catch! Got it. 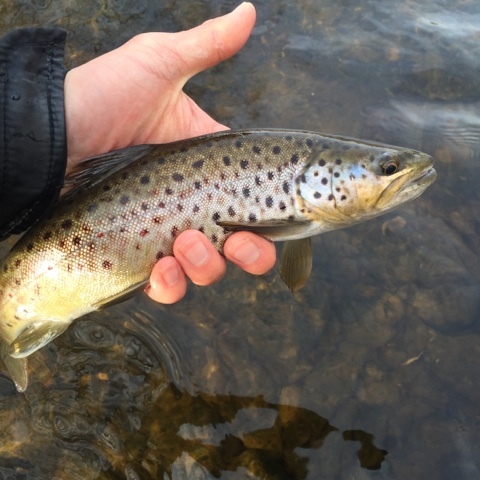 The browns I caught were really amazing-looking. Congrats on the great day! I would also like to compliment you on your blog, which I recently discovered. Currently I'm not able to get out and fish nearly as much as I would like to, and therefore I thoroughly enjoy reading about your experiences. Thanks and keep up the great work! That brown trout might be stream born by the looks of it. Well done getting the holdovers to hit. Thank you! I tell you, it took a lot of effort and quite a few visits to try and get them. But, it has been worth it. Nice! I fished there Saturday and Swift Sunday. What was working for you on the Farmington? I was doing well on small WD-40s, and small RS2s..like size 20-22. I don't know the river well, so I spent way too much time walking around blank water. The fish were sluggishly pooled up in their winter lies (slower water and seams), I noticed. 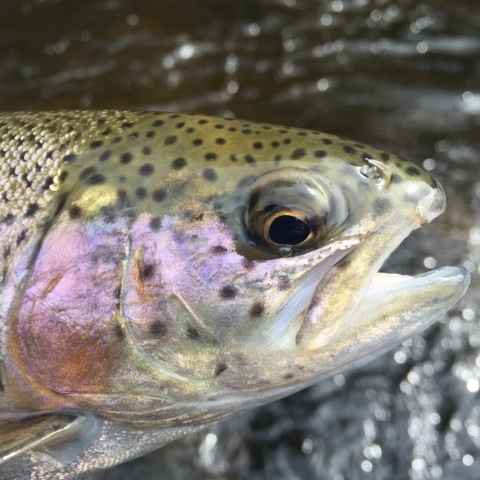 Too much energy to be holding in the riffles or fast water. Once I located them, I got a bunch in a row at each area. Congrats on catching fish. I just tied a few RS2s and hope to try them next time out. I hate splitting the tails and I'm a work-in-progress on that. Nice outing at the Farmy, it is a gorgeous river but I always struggle there and considering the distance I don't go much. Really great work lately on highlighting other rivers too, your blog is excellent.